Amazon has created a smoke-screen of confusion surrounding the “delivery fee” or “delivery cost” associated with ebooks published under their 70% royalty option. This post will clear away some of that smoke. If you select the 70% Royalty option for your Kindle books published through Amazon’s KDP then you must pay a flat $0.15/MB (rounded up to the nearest kilobyte) whenever you sell a book. The “delivery fee” is determined by the size of a MOBI file you upload when you are setting up your listing. Amazon’s wording is purposefully deceptive because it actually has nothing at all to do with “delivery,” how many times a customer loads a book on a Kindle, or the file size a customer receives or downloads when they make a purchase. It is a flat fee subtracted from your royalty with every sale. The delivery fee is a strategy they use to give publishers the impression Amazon pays the highest royalty of the big three–Amazon, Barnes and Noble, and Apple–without actually having to pay out at that rate. The truly devious part is that Amazon’s own tools for creating Kindle-compatible MOBI files will actually double or triple the size of any non-MOBI file you upload for conversion. If you use their Kindlegen application to make your own MOBI it will also increase your file size two to three times over because the conversion to MOBI bundles the complete EPUB in so Amazon has future-proof compatibility. This bonus for Amazon doubles or triples the amount we pay in delivery fees. If you upload your 30MB $6.99 eBook file, and are on a 70% royalty plan, you get dinged for a $4.50 delivery fee with every Amazon sale. Your 70% royalty for each sale is actually [$6.99 - (30MB x $0.15)] x 70% = $1.74. Since your 70% royalty is actually only paying you 25% you are then advised to just use the 35% royalty plan because there is no “delivery fee” at 35%. If I wanted to make the $4.89 royalty implied by the 70% plan I would need to price my $6.99 book at $11.50 so as to accommodate the delivery fee. 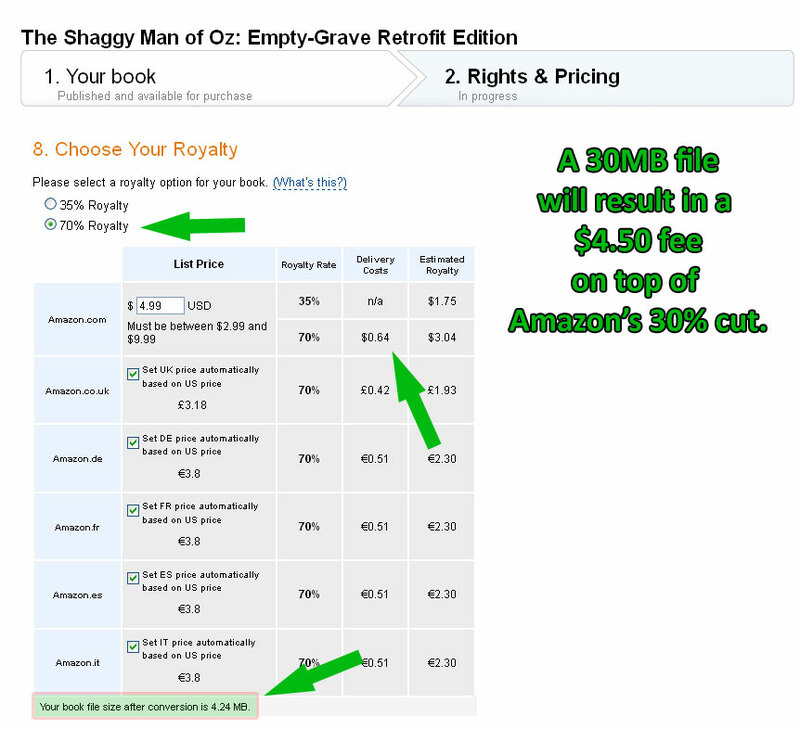 If the book was just 1MB of text+cover the 70% royalty would be $3.32. This is a pretty brutal punishment just for offering an eBook that contains high-quality images. If I publish a color comic book, or children’s book, aimed at looking as good as it can look on the Kindle Fire, I either have to charge exorbitantly to counteract the high fees or accept the fact that I will never make more than a 35% royalty from Amazon. To summarize: If you upload a 30MB MOBI when you create your book listing you will pay a $4.50 fee per sale or have to chop yourself down to 35% royalty. Solutions: I will detail some workarounds that decrease the size of converted MOBI files in subsequent blog posts. My ebook based on raw files is about 6 MB. When I downloaded the ebook for preview, I get 15 MB size. How to reduce this size? Will Amazon calculate delivery basedon 6 MB or 15 MB? Thanks a lot. Hi Arvind. I’m assuming that you are submitting a PDF, EPUB, or DOC file via the Amazon KDP website. When you submit in that manner Amazon converts your file into a MOBI format and in their effort to “future-proof” themselves they bundle a complete EPUB format inside the MOBI format. This “future-proofing” more than doubles the file size and comes, quite literally, at the expense of the author because Amazon then graciously charges us the whole delivery fee for a file they doubled in size themselves. The best thing you can do to avoid the file size doubling on Amazon’s end is to avoid their format conversion system altogether. You just need to submit a MOBI file to begin with. To do this I recommend you use a free program called Calibre, which allows for easy conversion across a wide variety of formats. I have an article about optimizing file size with Calibre over here: http://empty-grave.com/2012/04/decrease-kindle-file-size-with-calibre-to-lower-kdp-delivery-fees/. Best of luck with your book and feel free to drop by with any other questions! Thanks for the tip. I discovered today that Amazon’s KDP calculates delivery charges (for 70% royalty) based on the 6 MB I uploaded, not the 15 MB of the final file size. This worked out okay for me. I think your point is still valid. If I use Calibre, download size would be far less than 15 MB. Thanks for the update! If they are now charging based on the size of the unconverted file then using the KDP site file auto-conversion should be okay, as is using Calibre to create and submit a pre-optimized MOBI file. What I would avoid is using Amazon’s Kindlegen program to convert to MOBI prior to uploading because that program will double the file size you are uploading. You can decrease file size on MOBI files that you create with Kindlegen by using Kindlestrip, which simply strips out the extra EPUB Kindlegen bundles in with the MOBI. I’ve only found Kindlegen worth using when I’ve needed a complicated Table of Contents that is not supported by Calibre or KDP conversion, though. Who is getting what percent? Hi Hark. Depending on which option you choose, you will either be getting 35% or 70% (minus delivery charges). I can’t even get the option for 70% on the royalties. Is there a certain size the file/book has to be to get the 70% royalties to even show up? Hi Andy. The only reason I can think of where a book would default to 35% is if you set the book to “public domain.” Amazon only pays 35% for public domain material. Certain international markets also default to 35% regardless of the material. If you are in the US, publishing non-public-domain books, and you aren’t seeing the 70% option then I would contact KDP support. You may also want to try logging into KDP from a different browser to cover all your bases. Nicolai: yo no entiendo nada esas explicaciones. Tal vez porque lo leo en traducción al español. Al parecer no hay una explicación sencilla sobre qué opción tomar en cuanto a las regalías. Por qué no decir si la opción del 70% es la más conveniente para cualquier publicación, o si la opción del 35% es la correcta. ¡Qué enredo! Al parecer tiene que ver con el peso de la obra. Quiero publicar una novelita que tiene 4.70 MB. ¿Qué opción me conviene? Soy de Guatemala. Saludos para ti, y gracias por el favor al compartir tus conocimientos. Hi Romulo. I don’t speak Spanish but Google Translate did a great job. I understand you are asking which royalty option–35% or 70%–you should choose for a 4.7MB file. The calculations below assume Guatemala Amazon KDP has the same structure as the US. A 4.7MB file will have a $0.71 delivery fee if you choose the 70% royalty. You will want to price your book at $1.49 or higher if you choose the 70% option. If you charge lower than $1.49 then you should go with 35%. For example, if you charge $2.99 for your book you would receive $1.60/sale under 70% royalty versus $1.04/sale under 35% royalty. Hi Nicolai and thank you so much for this insight! I’m brand new to this and my eBook is just live, using Kindle Text Book Creator (converted from pdf by clicking “package for publishing” on KTB and saving before uploading). It saved it at 1MB though when I click to look at reports within KDP site it says average file size is 30.82MB thus a delivery cost of 3.08! List price without tax – 1.92 ( I’m lost and will make no money as I’ve priced it at $2.99 with 70% royalties). Hi Alison. Congratulations on your book going live! I would be happy to lend a hand with the size problem if you like. How many pages/words and does the book have any images in it? Books converted from PDF are sometimes problematic and while it may appear the text converts fine I often find that programs turn the PDF into individual images of the text. If you are unable to highlight or copy/paste the text in the eBook file then that is probably what happened. Many other programs that claim to convert PDF files to editable text actually run OCR on the file and the results are typically awful and riddled with errors. Some programs are also a bit sneaky in that they repackage the book in multiple formats in the same file to increase device compatibility. The result of that, though, is a bloated file that is expensive to sell on KDP. As I said, I would be happy to help. You can contact me directly at Nicolai(at)Empty-Grave(dot)com. If you feel comfortable with me looking at the source PDF and the converted file I can get a better idea of what’s going on. If you haven’t already, I can also help with publishing in print format via Createspace, which I highly recommend as there are no Createspace fees and everything feels so much more real when you have a paper copy of your book in your hands. Thanks for dropping me a line! Sorry it took a couple days for me to reply. I rarely receive comments or feedback. Yours was stuck in the moderation queue and, for whatever reason, the site didn’t automatically email me to let me know there was a comment. It was pure luck I happened to be checking the site today as I haven’t looked at it in a couple months.